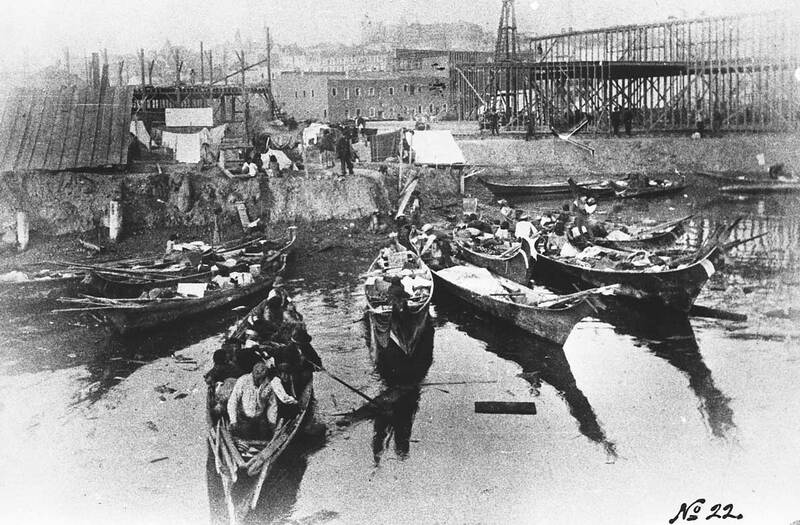 NOW: After Seattle’s “Great Fire of 1889” consumed all the waterfront south of University Street, this part of it south of Yesler Way was reconfigured with larger docks and warehouses including Pier 48, which covered the waterway at Main Street. With the recent razing of Pier 48 the site has added more sprawling paving. Launched in Portland in 1871, the slender sternwheeler Emma Hayward gave her first eleven years on the lower Columbia River dashing between Portland and Astoria. She was, the McCurdy Marine history claims, the favorite passenger boat on that packet. 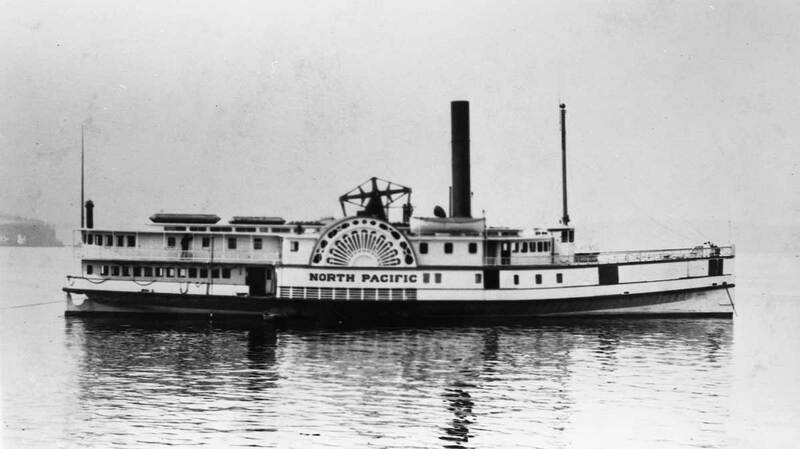 Anticipating the 1883 completion of the Northern Pacific Railroad’s transcontinental to Puget Sound, the sternwheeler’s owner, the Oregon Railroad and Navigation Company, sent her across the Columbia Bar en route to her new Puget Sound service. 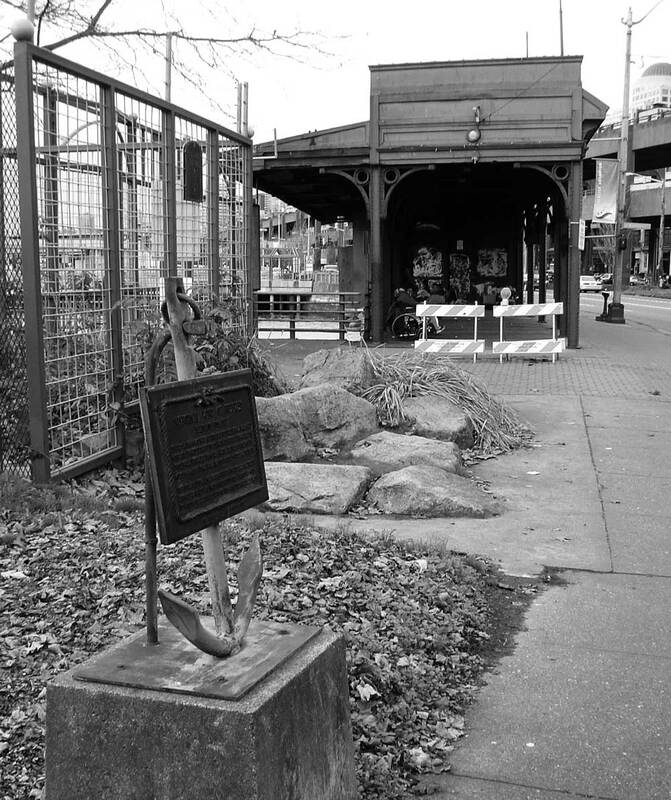 She reached Seattle on Oct. 24, 1882, and soon after began her daily round trips between Seattle and Olympia, with the most important stop at Tacoma for connecting passengers with the Puget Sound terminus there of the Northern Pacific. Here she rests in the slip between Seattle’s Ocean dock on the right, for the larger ocean-going vessels, and its City Dock on the left, for the Puget Sound “mosquito fleet” of buzzing smaller steamers. Most of the latter were home ported in Seattle in spite of Tacoma’s alluring railroad. 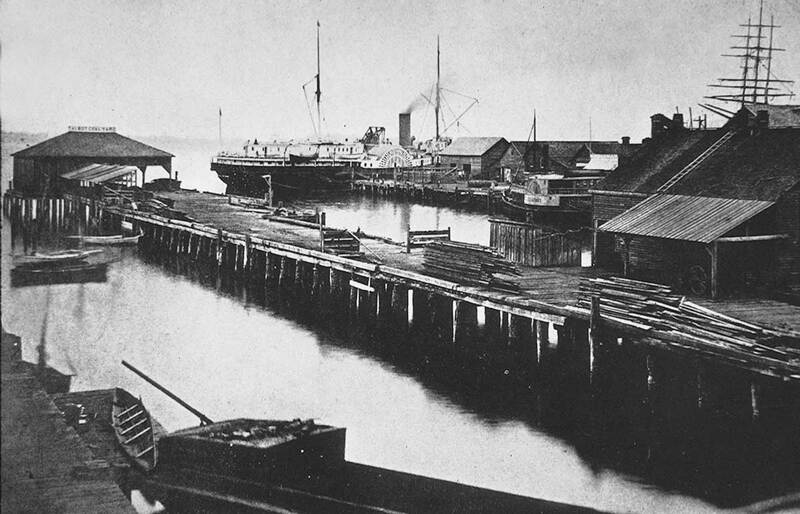 These Oregon Improvement Co. docks were added to the waterfront in 1882-83. Taking notice of the dainty tower on the Ocean Dock, here to the far right, the Seattle Post-Intelligencer, for Dec. 9, 1883, included it in its list of then recent waterfront improvements. “Not the least of these is the placing of the fog bell above the Ocean Dock warehouse. The neat little cupola erected for this bell enhances the fine appearance of the building considerably. 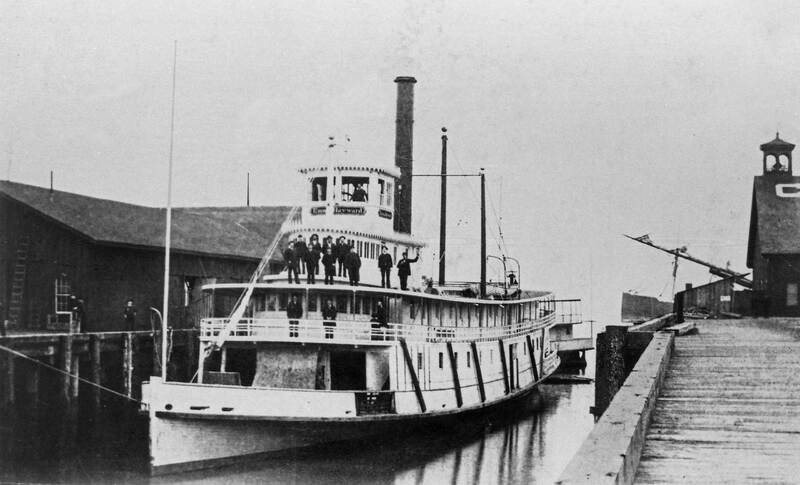 The Emma Hayward returned to the Columbia in 1891 where she was repaired a year later to serve as a river towboat until 1900 when – quoting McCurdy once more – she was abandoned. Certainly Jean. Anyone who is especially keen on this subject of waterfront history might like to browse our Illustrated History of the Seattle Waterfront. It can be found with its own cover (for clicking) here on the far right. Next we will include a few waterfront features from past printings in Pacific-plus. 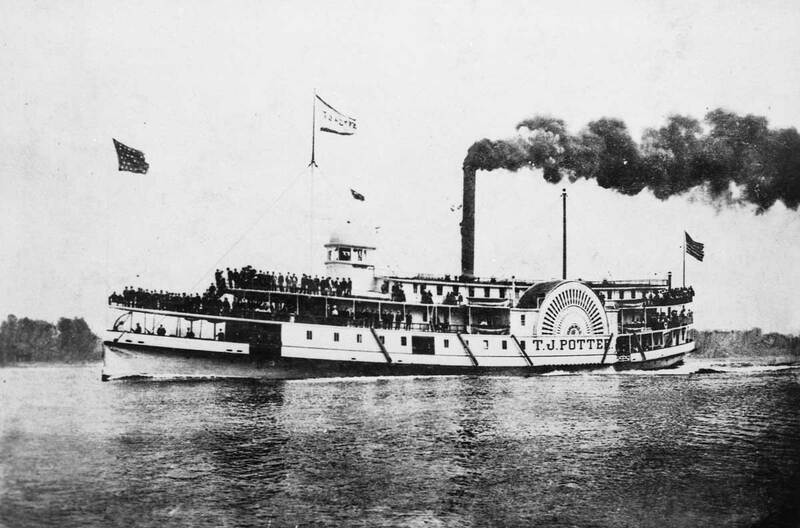 But first we will begin with another recording of the Emma Haywood, this time after the 1889 fire destroyed most of the waterfront, and now bobbinh between the post-fire Pier A and the much larger side-wheeler, the T.J. Potter. Looking north from the King Street wharf. LaRoche has dated this June 6, 1891, the second anniversary of Seattle's "great fire." The Emma Haywood bobs at the center. Note the as yet unopened Denny Hotel on the horizon. It straddled 3rd Ave. between Stewart and Virginian Streets on the southern summit of Denny Hill. The North Pacific, on the left, and the T.J. Potter, again looking north from the King Street wharf. If Puget Sound organized a maritime hall of fame, the sidewheelers North Pacific and T.J. Potter would be promptly included. They won most of their races and made their fortunes. 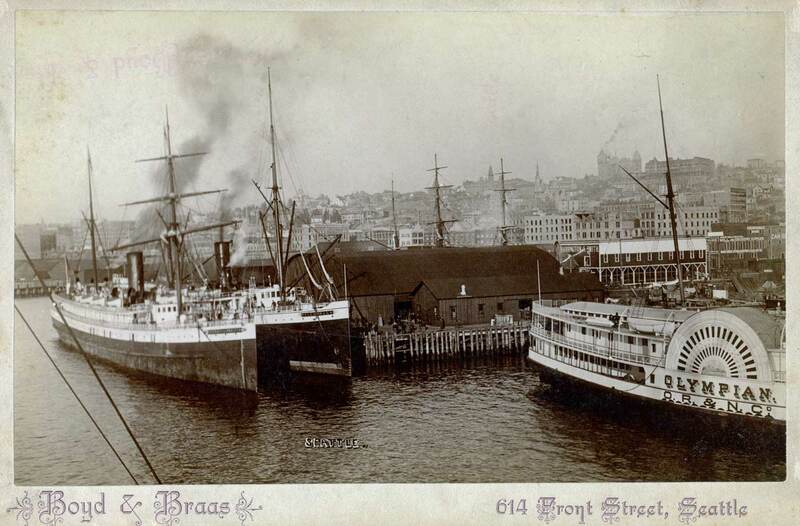 In today’s historical photo they are moored beside the Oregon Improvement Company’s “B” dock at the foot of Main/Jackson Street. The North Pacific resting in Elliott Bay. The smaller North Pacific was built in San Francisco in 1871 to battle the steamer Olympia for supremacy on Puget Sound. 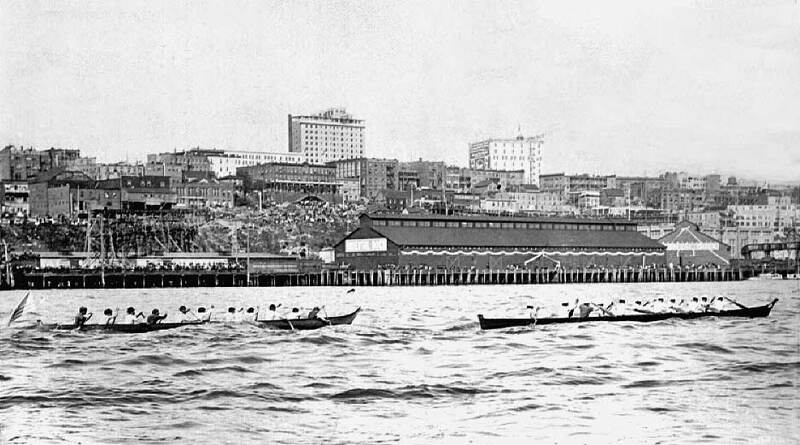 Beating the Olympia by three minutes in a mightily wagered and still famous race from Victoria to Port Townsend, the North Pacific effectively kicked its competitor off the Sound – but only after Olympia’s owners received an $18,OOO-a-year subsidy to stay away. For 32 years, the North Pacific worked Puget Sound until striking a rock in a summer fog off Marrowstone Point and sinking in the deep waters of Admiralty Inlet. T.J.Potter underway - most likely on the Columbia River. Stack. Soon after, on April 27, 1891, the Bailey Gatzert returned the favor, and after victory, flaunted it with a whistle-tooting trip around Elliott Bay. Two months later, the T.J. Potter set a record on the Tacoma run of 82&1/2 minutes. T.J. Potter at Ilwaco near the mouth of the Columbia River. A different photo studio, Boyd and Braas, but still the early-1890s, and also recorded from the King Street Coal Wharf - its outer end. The sidewheeler here is the Olympia, and the steel-hulled steamer on the left, the Queen of the Pacific and the Walla Walla. A Similar point-of-view by Frank Shaw on Nov 9, 1968, and during late construction of the Seafirst tower. The scene looks east toward the block between Jackson Street on the far left and King Street on the right. King was then still a railroad trestle built above the tides, and all the structures that appear on the right side of this view – the railroad shops and a lumber mill – are also set above the tideflats. The white hotel on the far left with the wrapping porch, shutters and shade trees is the Felker House, the first Seattle structure built of finished lumber. Two of what we may kindly call the hotel’s “urban legends” survive its destruction in the “Great Fire” of 1889: First, that it was the town’s original whorehouse. Second, that its overseer – Mary Ann Conklin, aka “Mother Damnable” – turned to solid stone sometime between her death in 1873 and difficult resurrection in 1884 when her body was hauled to a second grave. Believe it or not, her features were intact. Two more semi-solid points – both about the “native land” shown here: First, it is still a quarter-century before the ridge on the horizon would be lowered 90 feet with the Jackson Street regrade. Second, the tide is out and the small bluff above the beach is the same on which the Duwamish tribe built its longhouse. There, the Indians looked out on the bay probably for centuries before Captain Felker substituted whitewashed clapboard for cedar slabs. 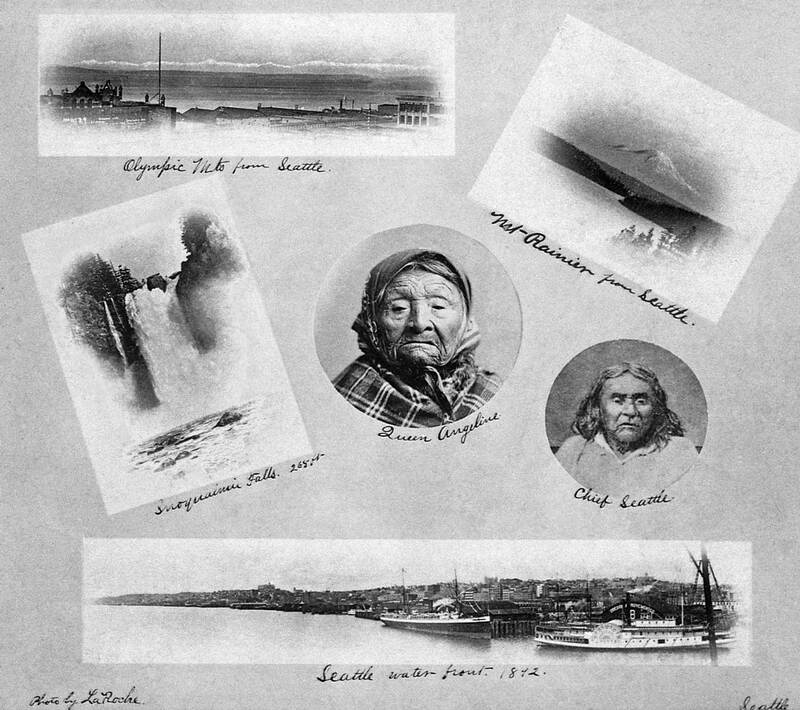 A montage of scenes photographed by LaRoche in the early 1890s, with the exception of the Chief Seattle portrait, which he copied from the Sammis photo of 1864 or '65. Princess Angeline - the Chief's daughter - is at the center. At the bottom is another example of a waterfront panorama taken from the King Street dock. One year earlier when the side-wheeler Dakota was awarded the mail contract between San Francisco and Victoria, it added Seattle, Tacoma and Olympia to a West Coast packet it’d been running since 1875. 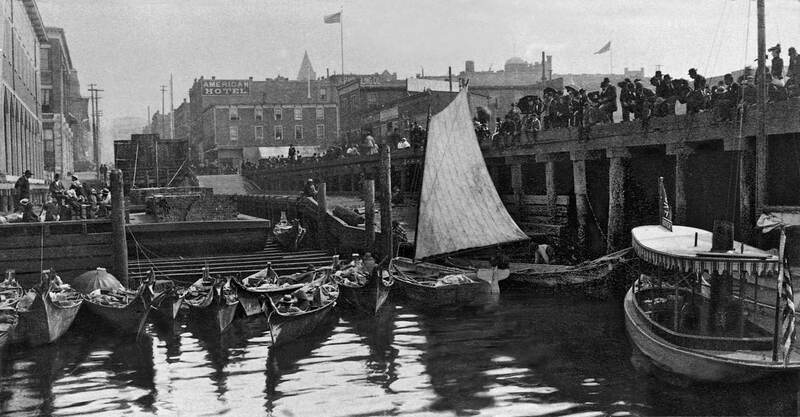 Here the side-wheeler pauses at the end of Yesler’s Wharf which, until the fire of 1889 destroyed it and every other dock south of Union Street, was the principal pier on the waterfront. 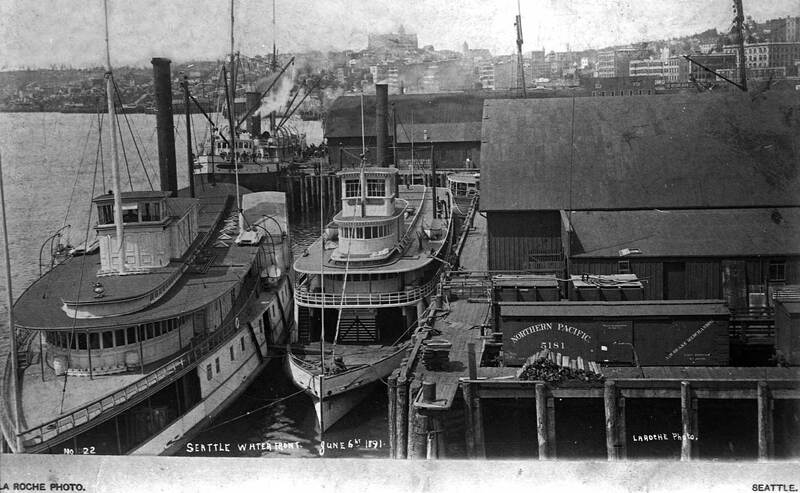 Just right of center arid also tied to Yesler’s Wharf is a smaller side-wheeler, the J.B. Libby. 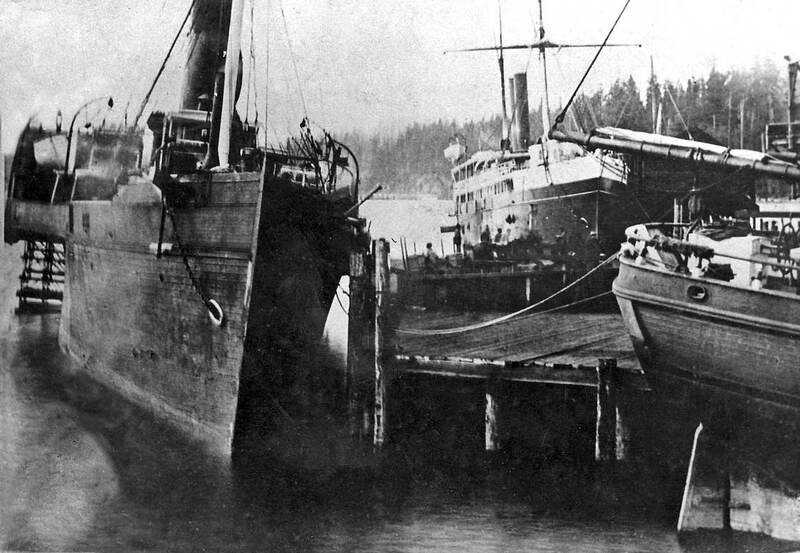 The Libby was launched at Utsaladdy on Camano Island in 1862, and in its quarter-century of working Puget Sound, became the best known small steamer on these waterways. In November 1889 while en route from Roche Harbor to Port Townsend carrying 500 barrels of lime, the Libby lost its rudder in a storm and caught fire. It carried seven crew and seven passengers, the latter escaping on the steamer’s lifeboat and the former on rafts. All survived. At the outer end of the Crawford & Harrington Wharf sits the pier shed for the Talbot Coal Yard, named for a San Francisco capitalist who bankrolled early mining of the Renton coal fields. The greatest coal exporter from this waterfront was the Oregon Improvement Company’s big coal wharf and bunkers at the foot of King Street. The company’s coal exports then to San Francisco were many times greater than its imports to Puget Sound. Especially from 1878 to 1881 the OIC’s greatest import was ballast that it would dump in the bay before loading up on coal. These contributions constructed our “Ballast Island” off of Washington and Main Streets. On what is perhaps the earliest (and only) surviving print of this maritime scene an inked caption is scribble along the right border. 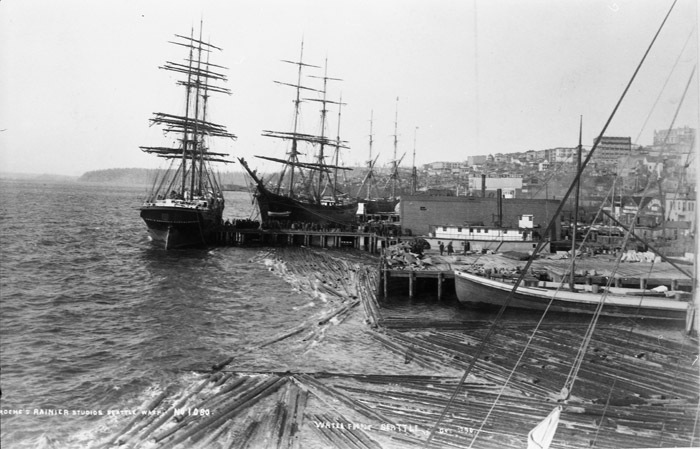 It reads, “Steamships Salvador [middle] and Pacific [left] and bark Harvest Home [right] at Yesler Wharf in 1875.” The bible on the subject, “Lewis and Dryden’s marine History of the Pacific Northwest” (published in 1895) describes 1875 as “The Disastrous Year.” And of all the ill-fated vessels of that year the Pacific’s ending was by far the worst . 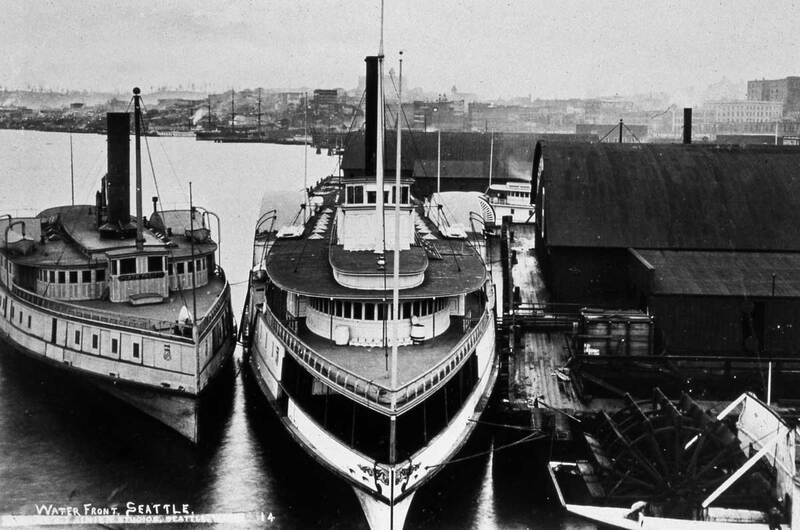 Here the side-wheeler leans against the outer end of a Yesler Wharf that had been lengthened considerably in the preceding year with a dogleg. Perhaps this is her last visit. 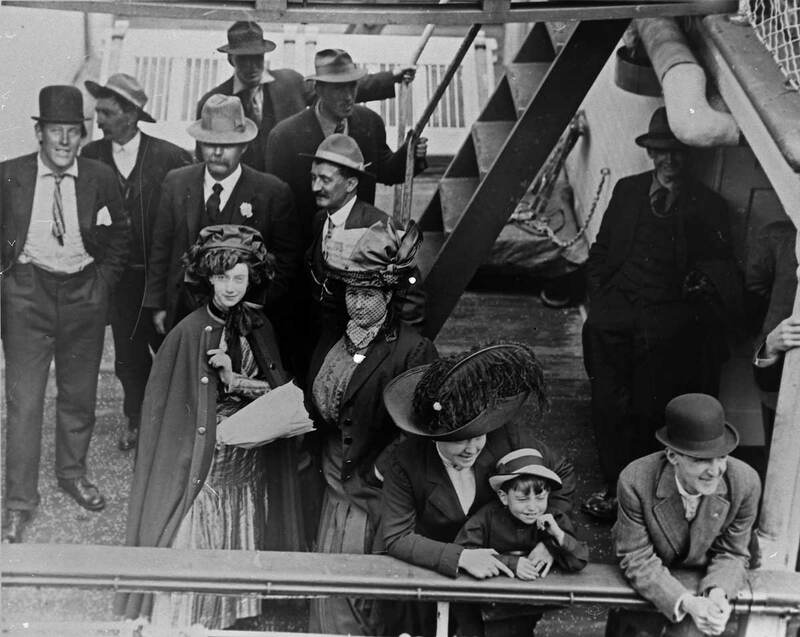 The Pacific was then involved in a rate war and the passengers who boarded her considered themselves extremely lucky to be paying a fraction of the normal thirty dollar fair to San Francisco. After steaming from Victoria at 9:30 A. M. November 4th, and rounding Tatoosh at about 4:00 P.M. the Pacific then met stiff winds and hard going but would have easily survived the weather except that when fifteen miles off-shore she improbably collided around 10:00 P.M. with the collier Orpheus that was headed north to Nanaimo for coal. Of the about 240 passengers on the Pacific only one survived by clinging to some wreckage. It is still a grim regional record. Seven years later the Harvest Home was wrecked about eight miles north of Cape Disappointment but with different results. With its chronometer broken the barkentine went aground, to quote again from Lewis and Dryden, “in thick weather . . . and the first intimation the man on watch had of danger was when he heard a rooster crowing in an adjoining barnyard . . . When day dawned all hands walked ashore without dampening their feet.” The wreck was for years after a Long Beach attraction. On Jan. 5,1865, the Territorial Legislature granted Seattle incorporation, and the small town of about 300 responded by quickly electing a board of trustees. The new council answered its citizens’ urge for municipal order by giving them 12 laws. The first, of course, was for taxation. There followed ordinances for promoting the public peace by prohibiting drunks, restraining swine (the 4-legged kind) and setting a speed limit against reckless horse racing on the city’s stumpy streets. The fifth ordinance was titled, “The Removal of Indians,” and read in part: “Be it ordained that no Indian or Indians shall be permitted to reside or locate their residence on any street, highway, lane or alley or any vacant lot in the town of Seattle.” For the Indians’ hospitality and help in teaching the settlers the ancient techniques of nurturing the abundant life on Puget Sound they were given reservations, smallpox, firewater, blankets, a kind of Christian education for their segregated young and the ” security” of the white man’s laws. In Seattle of 1865, this included that ordinance to keep them out of town. 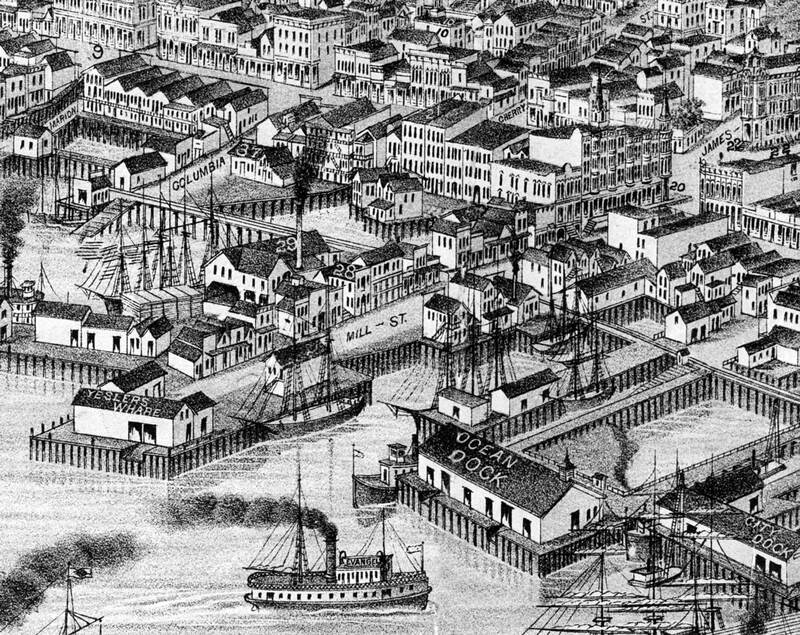 A detail from the city's 1884 birdseye shows the "captive" condition of Ballast Island set behind the pier, bottom-right. Compare this to the 1888 real estate footprint of the same site that follows. 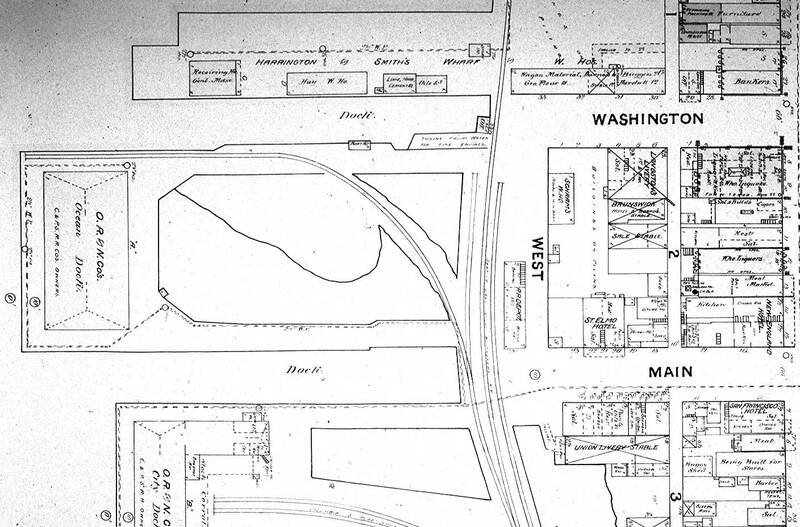 A waterfront footprint at the foot or feet of Washington and Main Streets in 1888. This, of course, was all flattened by the '89 fire, excepting Ballast Island. 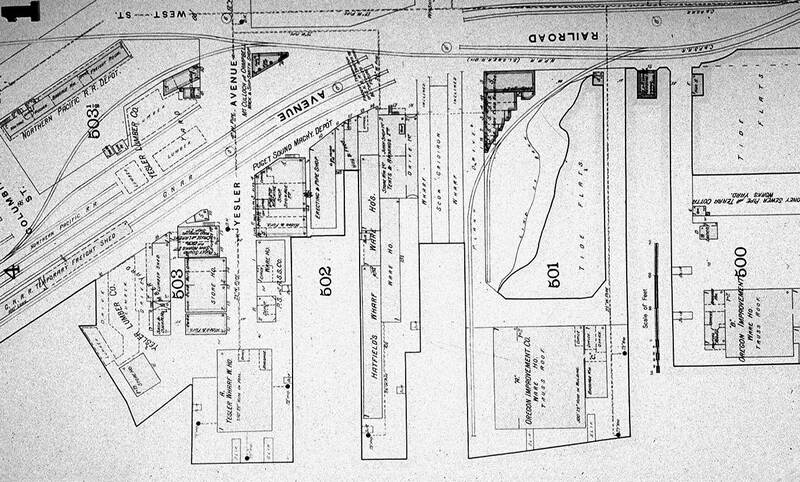 A post-fire 1893 footprint of the same neighborhood with the surviving ballast. Ironically, Ballast Island was made from the hills of Australia, the Sandwich Islands (Hawaii) and, in largest bulk, San Francisco. Ballast was the stabilizing deadweight of rocks and rubble that the many-masted ships would carry here and simply dump into the bay. They then would fill their empty holds with coal or lumber. Sometime in the late1870s the captains were persuaded to unload ballast in one place: alongside the short wharf at the foot of Washington Street. 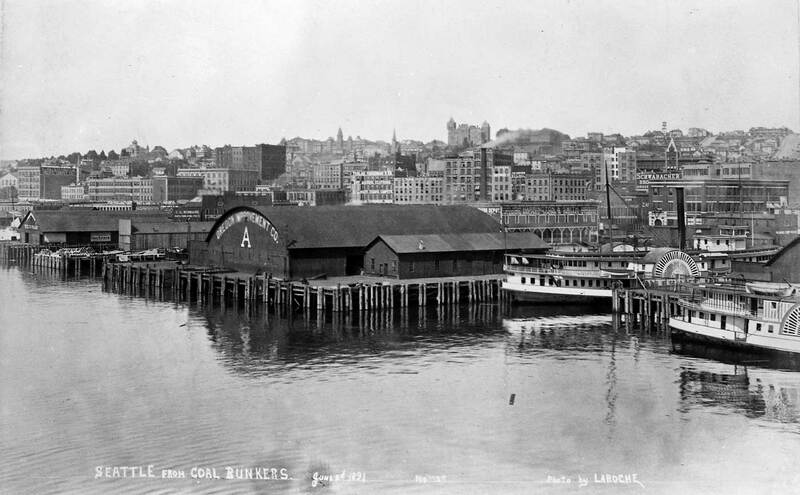 The site was good, for it was between the city’s two busiest piers: Yesler’s wharf (1853) and the Oregon Improvement Co’s King Street coal bunkers (1877). The site was also bad – at least it was so decreed by the Seattle City Council on May 7, 1880, as revealed in the accompanying clipping from the Intelligencer. 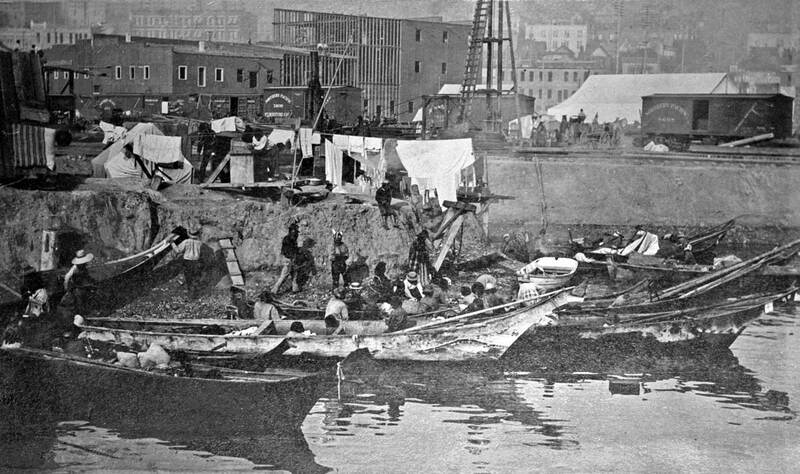 By then, however, the ballast at the foot of Madison was formidable enough to be serve as the foundation for the island, and most likely the dumping was eventually resumed for the purpose not of giving refuge and accommodations to visiting Indians, but rather to give more secure foundations to the network of wharfs that would be built there in the early 1880s. 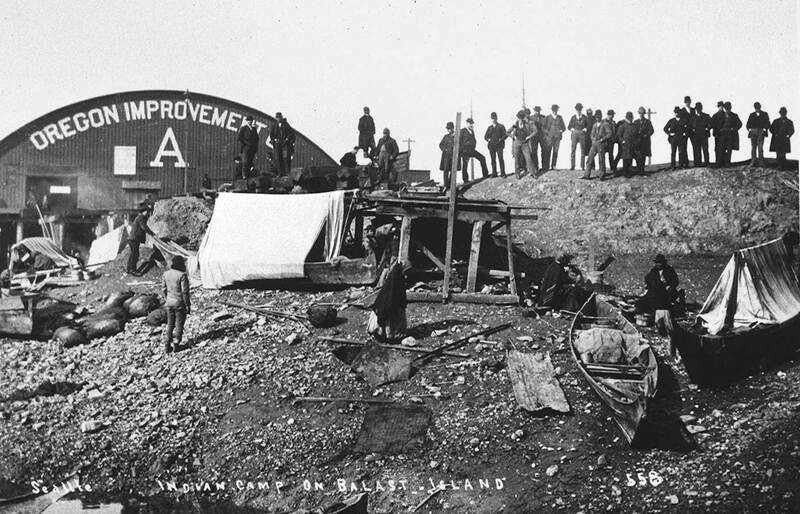 Our look into of Ballast Island was photographed by Arthur Warner sometime in the early 1890s. 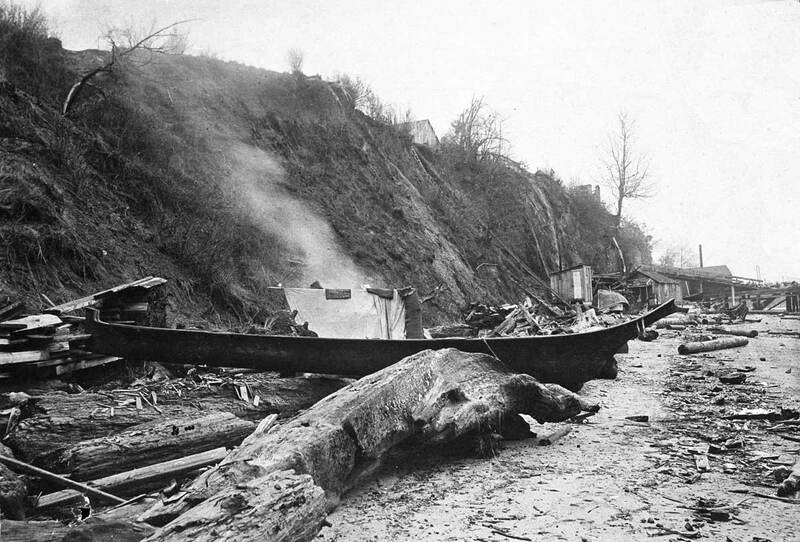 After the 1889 fire destroyed the entire waterfront south of Union Street, property owners usually rebuilt, three and . four times grander than before the destruction. The Oregon Improvement Co. filled the waterfront between its coal docks off King Street and Yesler’s wharf with two large pier sheds it designated simply as A and .B. The area between these sheds and the business district along First Avenue was neither entirely filled with ballast and rubble nor was it in every place covered with piers. 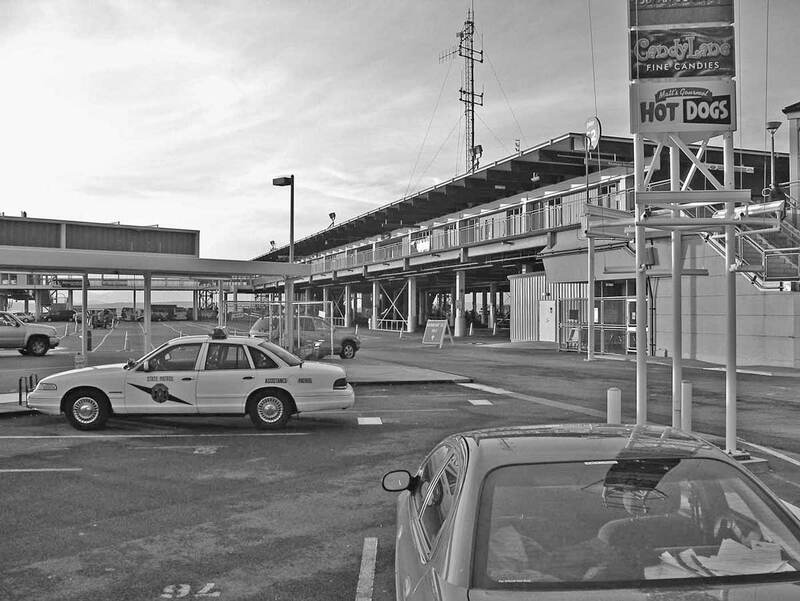 Thus until the mid-1890s it still was possible for native dugouts to make their way between the Oregon piers and up under the overhead quay to Ballast Island. Another June 6, 1891 recording by LaRoche from the King Street Wharf. 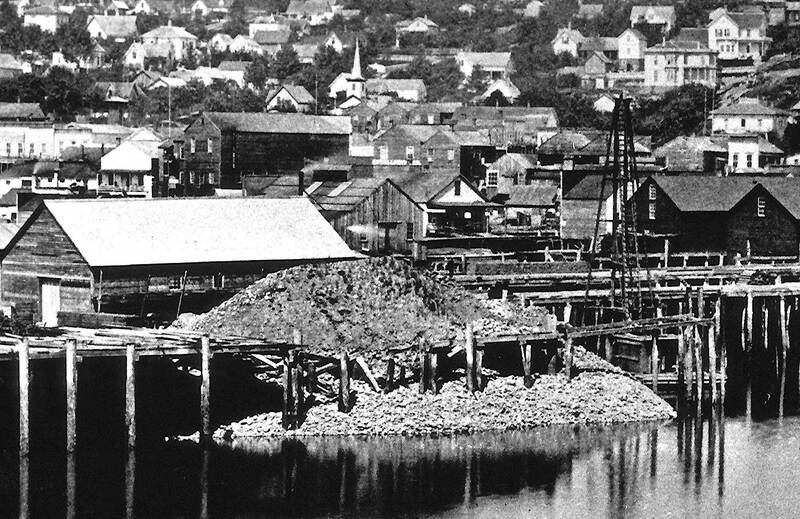 In the foreground is the waterfront neighborhood whose footprint of 1893 was include above. A glimpse of Ballast Island can be found above the stern of the Sehome, the larger side-wheeler resting in the slip between Piers A and B. I have not as yet identified the side-wheeler seen in part far right on the outside of Pier B. Central School is the largest building on the horizon. It set in the block between Madison and Marion Streets and Sixth and Seventh Avenues - now part of the Seattle Freeway trench. 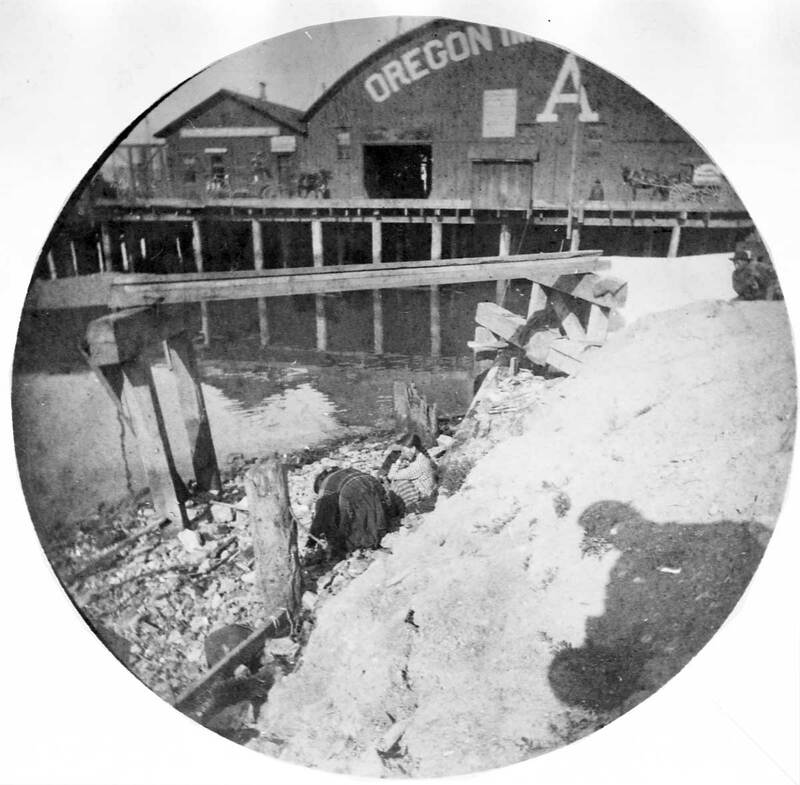 During the winter of 1891 the Oregon Improvement Co., seeking to improve itself, pressured local officials to remove the “some 40 clam-selling, garbage-raking remnants of a great people” who then were living on the island. But the eviction was only temporary, and especially ineffective every fall when the island was the jumping-off spot for natives from as far north as Upper British Columbia who gathered to pick hops in the White and Snoqualmie River Valleys. In 1895, the Oregon Improvement Co. went bankrupt. 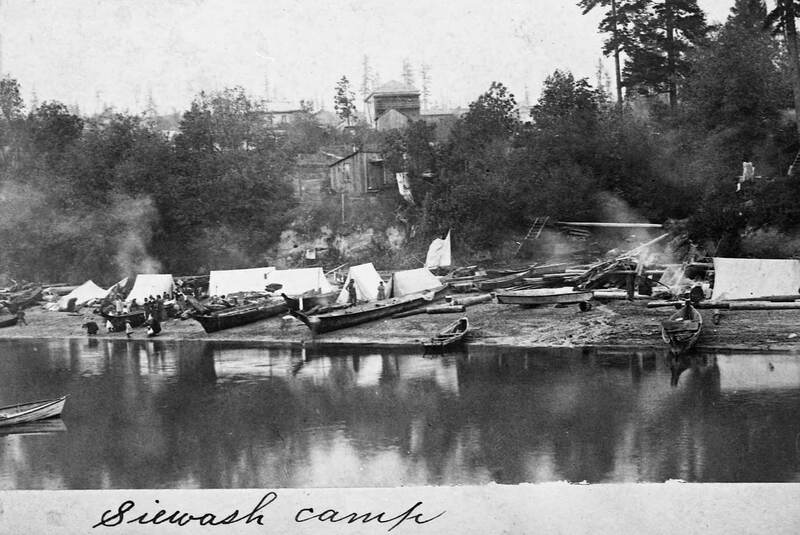 By then the native encampment had moved south toward Utah Avenue and Massachusetts Street. 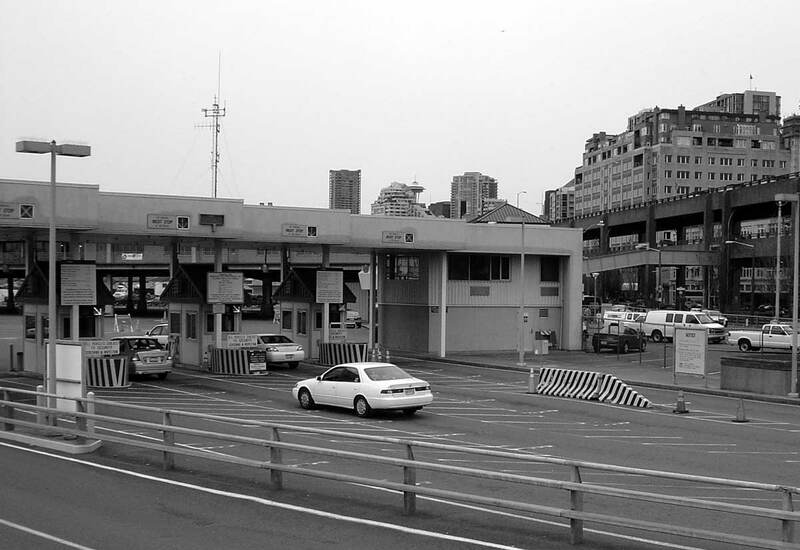 The ambiguous area between the waterfront and the wharves was increasingly filled in not with ballast but the city’s construction waste and Railroad Avenue was planked over all these contributions to Ballast Island. Dugouts at the foot of Washington Street. Today is Waterfront Day in Seattle. (To clarify: on May 20, 1984) At Pier #55, the Virginia V will toot its steam whistle at one o’clock to begin the festivities, including rowboat races, a parade of working boats off shore and a casual procession of waterfront walkers on shore. Many of the vessels in the slips between piers will be open for tours. And on the Virginia V, the last of Seattle’s century old Mosquito Fleet, there will be a photography exhibit of maritime Seattle. Today’s historical photo is one included in the show. The view is east from the foot of Washington Street to a scene from the early 1890s. But the occasion is not known. Why should the wooden quay on the right be topped with a row of gawkers? It seems to big a line for that popular post-pioneer pastime of Indian watching. Below them are a dozen dugout canoes. Behind’ them, and out of the picture to the other side of the pile trestle, is Ballast Island, then a frequent camping ground for natives on their way to hop picking in the fall or canoe races in the summer. Only on the left are the races mixing. Judging from the postures (the natives are sitting) and the costumes (the suits are standing) it is possible that some bartering for curios or clams is transpiring there. 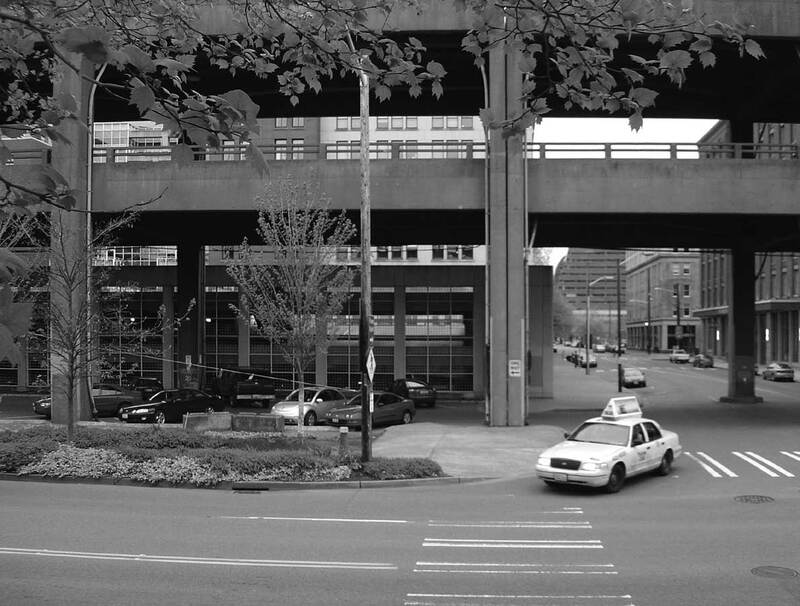 My hunch is that this scene is somewhere on the beach below Denny Way - before the regrading - or north from there, although I have not been able to confirm it - as yet. This speculation makes the horizon line part of Queen Anne Hill. Another Elliott Bay waterfront, again with the most likely part of it that is north of Denny Way. 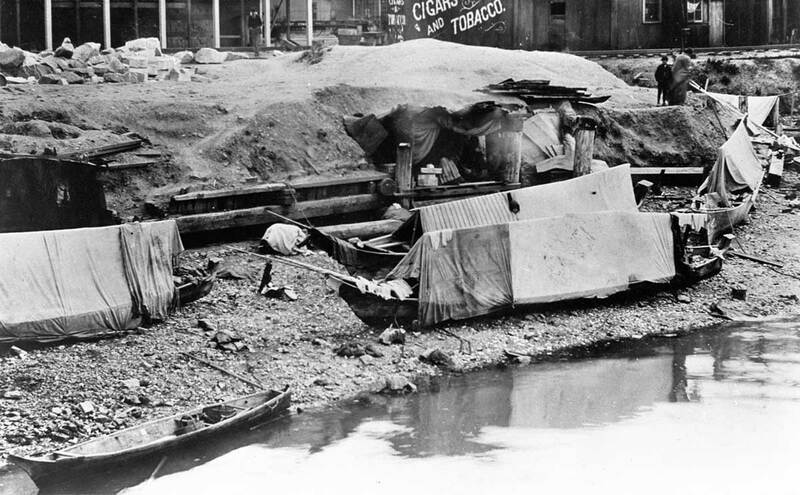 Work on a dugout on some Alaska waterfront. Today at 2 p.m., folks will be racing – backwards – in rowboats with two oars here at the foot of Washington Street. There may be some accidents. Races off the Belltown waterfront. The highrise left-of-center is the New Washington Hotel at the northeast corner of Second Ave. and Stewart Street - since renamed the Josephinum. The historical view looks to the northeast from a timber trestle that following the “Great Fire of 1889”was built into the bay along the south margin of Washington Street. The site is identified by the line of minimal white posts in upper left corner of the photograph. They are supports for the short-lived Harrington and Smith warehouse that was constructed to the west of the railroad track (upper-right) that linked this south end of the central waterfront with the Yesler’s wharf (one pier to the north) and beyond it the great swath of tracks and piers along Railroad Avenue that was then under construction following the fire. The Great Fire had destroyed everything on the waterfront south of University Street to the waterline. Everything, of course, except Ballast Island. 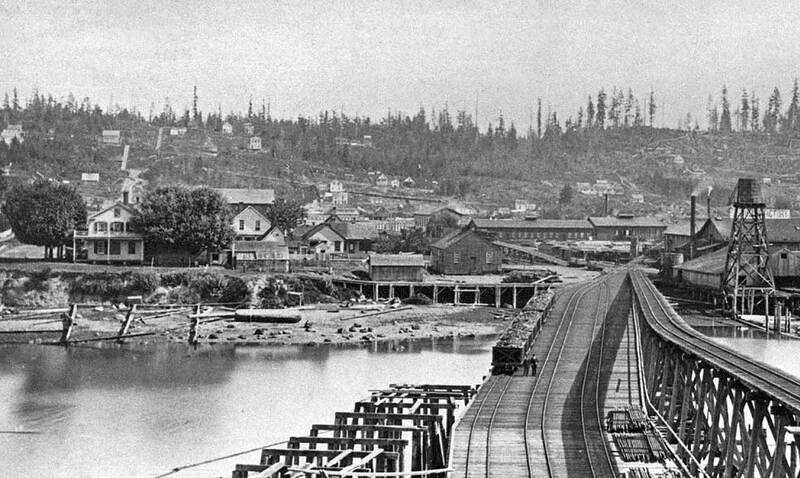 The neighborhood in 1893 looking north from the then recently elevated King Street trestle. Note the white pillars or posts of the Harrington and Smith warehouse - identified above - on the north side of Washington Street. A glimpse of Ballast Island evident this side of the warehouse and to the other side of the little steamer Mabel, which rests in the hidden slip to the other side of the sheds that are prominent near the center of the scene. There are conflicting stories of the “island’s” origins. By one telling captains were ordered to unload here the broken rocks and bricks they carried to give stability to otherwise empty ships. 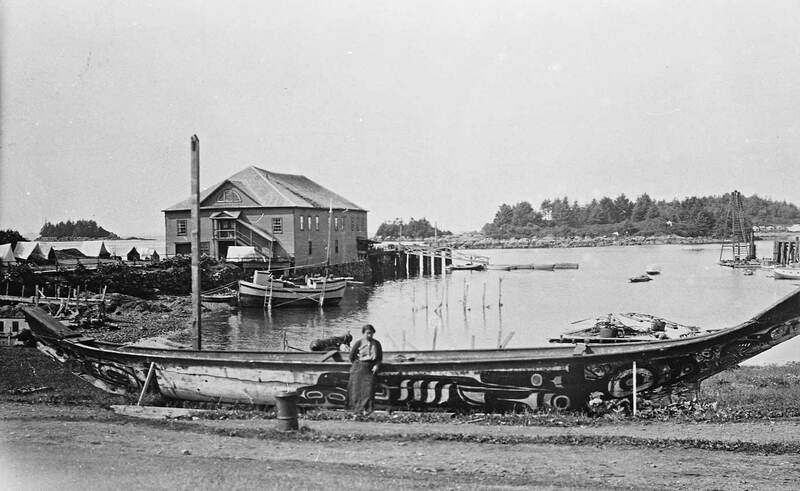 By another friendlier account pioneer wharf owners John Webster and Robert Knipe asked that the ballast be dropped to the side of their Washington Street pier to protect the piles from wood-eating worms. Whichever, a modern core sample taken near the plaque would bring up a cosmopolitan mix of rubble from San Francisco, Hawaii Islands, Australia and many other far-flung ports. Another post-89' fire Ballast Island scene near the boot of Main Street. The “foreign land” of Ballast Island, of course, is most famous as the strange terra infirma on which the region’s displaced indigene camped during hop-picking time in September. This “foreign-native” irony seems to have been totally missed by the “Indian-watchers” of the time. They crowded the perimeter of the imported dirt pile in the early 1890s for close-up looks (like this one) of the “exotic” Indians who came prepared to skillfully barter to the locals the baskets and other curious with which they loaded extra dugouts to the brim. Some of the construction work in this scene can be found in the subject directly above it. 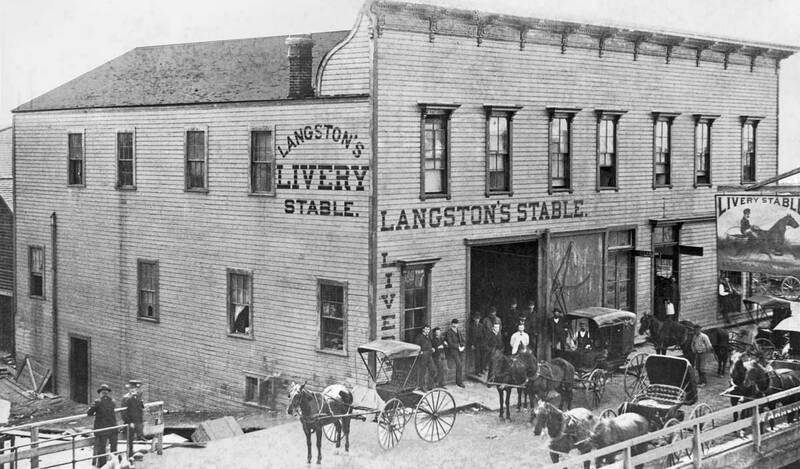 Helen and John Langston moved to Seattle from Kent in 1882 and soon opened their namesake livery stables on the waterfront at Washington Street. Like all else in the neighborhood it was, of course, destroyed in the city’s Great Fire of 1889. Sometime in the few years it served those who wished to park or rent a horse or buggy downtown a photographer recorded this portrait of a busy Langston’s Livery from the back of the roof of the Dexter Horton Bank at the northwest corner of Washington and Commercial Street (First Ave. S.). 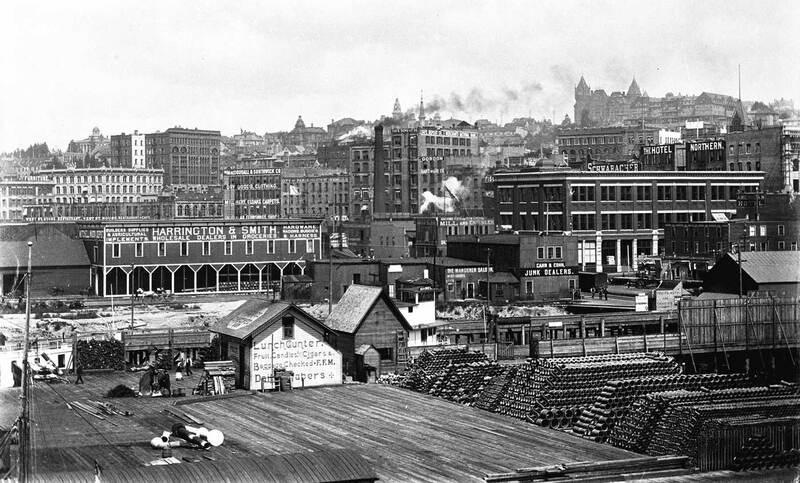 The Langston Livery appears far left in this birdseye prospect, probably taken from the top floor or roof of the Occidental Hotel on Mill Street (Yesler Way). Note how Ballast Island is here nestled within the trestles and warehouses of the Oregon Improvement Co. This scene may also be compared to the first one on top - the one showing the Emma Haywood resting in that slip at the top. Here we also see the King Street Coal Wharf (top-left), from which so many photographers took panoramic views of the city. After the fire the Langston’s soon opened another Livery Stable uptown beside their home at 8th and Union. In the 1903 collection of biographies titled “Representative Citizens of Seattle and King County” John Langston is described both as “now living practically retired” and also busy “in the operation of his magnificent funeral coach, which is one of the finest in the northwest and which is drawn by a team of the best horses.” Three local undertakers kept him busy. For the moment we may wonder – only – if when he died in 1910 the then 68-year-old pioneer took his last ride in his own coach. Frank LaRoche was born in Philadelphia in 1853, the year that Henry Yesler got the first steam sawmill on Puget Sound operating at the foot of Mill Street (Yesler Way) in Seattle. 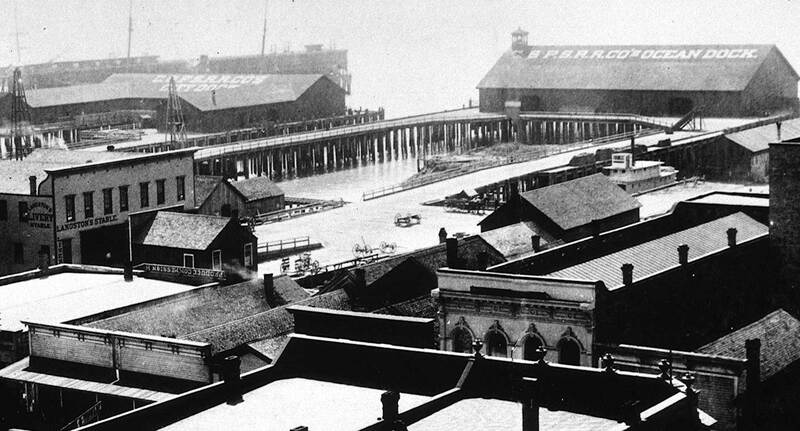 Thirty-seven years later LaRoche made this record of Yesler’s Wharf when the city was still rebuilding from its “Great Fire” of 1889. Even before the fire Yesler moved his mill to Union Bay on Lake Washington. The wharf was too valuable a commercial space to be wasted on processing logs. The corralled timber floating here in the foreground may be logs picked for piles in the rebuilding of the waterfront. Or this may be merely the log pond for the Stetson and Post mill that was then just off the tideflats south of King Street. LaRoche had worked as a professional since his late teens, taking assignments from railroads and publishers (Harpers’s Bros sent him to Australia) opening studios in Salt Lake and Des Moines and teaching photography in New Orleans. As might be expected after he arrived on Puget Sound in 1889 his work hereabouts is some of the best extant. 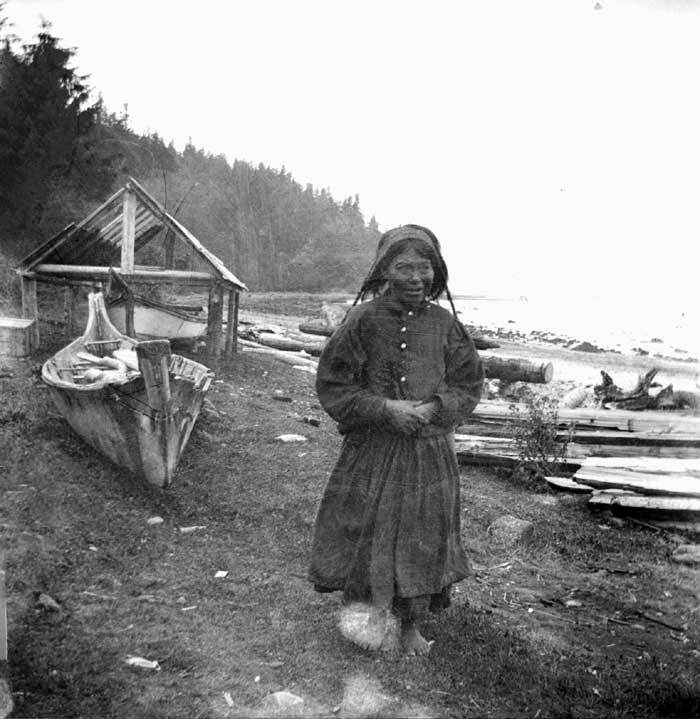 The University of Washington Northwest Collection has about 400 Puget Sound examples but he shot many more including several thousand as he followed the Alaska gold rush of the late 1890s. The professional has numbered this view1080, and thankfully also dated it December 1890. Here the LaRoche oeuvre included many of what were then our “obligatory” subjects like Chief Seattle’s daughter Princess Angeline and Mt. Rainier from several prospects. But he also left us cityscapes of every sort – buildings, parks, streets, mills, trolleys and scenes along the waterfront like this one. After he moved to Arlington a popular trick was cramming Snohomish County lumberjacks together atop huge cedar stumps for company portraits. LaRoche continue to act the pro until the mid-1920s and lived until 1936. Perhaps some member in good standing with the Puget Sound Maritime Historic Society can come up with the names of those windjammers. 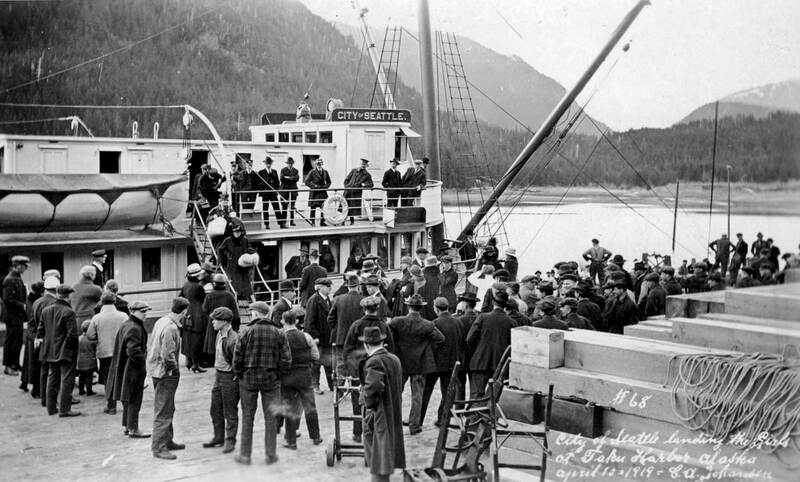 During the thick of the Alaska gold rush, Seattle controlled more than 90 percent of shipping to and from the territory. 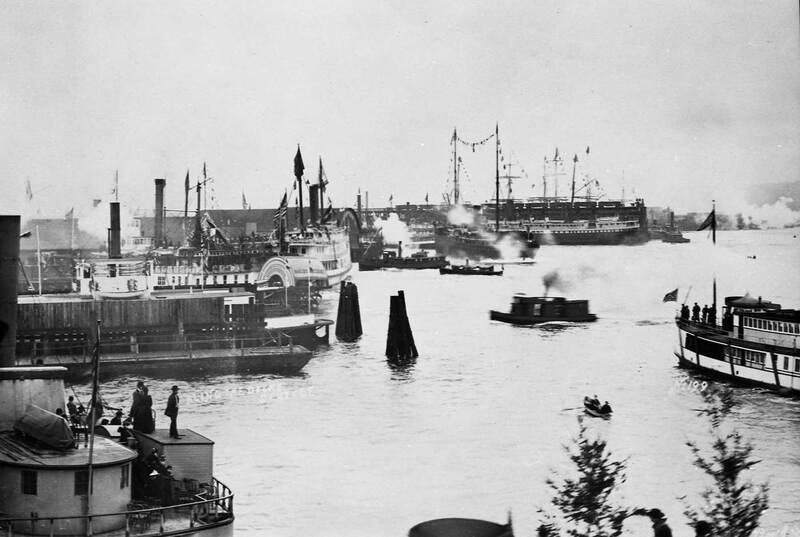 In 1890, there were 40 steamships commuting, the fastest of which was the ship shown here, the City of Seattle. It was 244 feet long, and plush. Built in Philadelphia in 1890, it sailed through the Strait of Magellan to Puget Sound in time for its most prestigious moment. 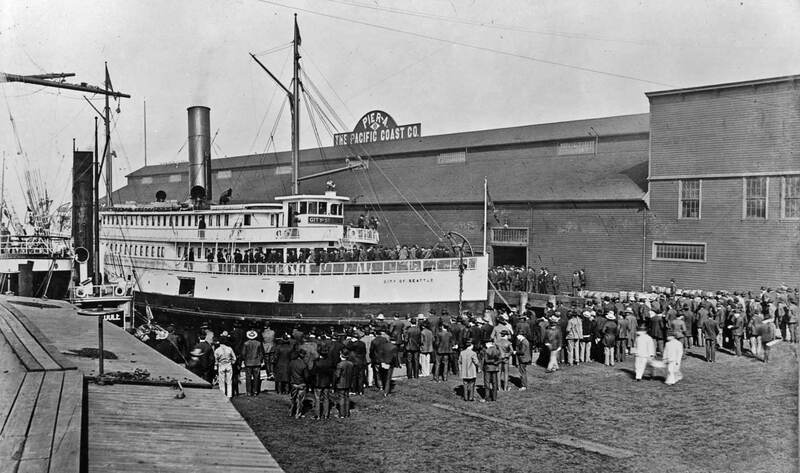 On May 6,1891, leading an armada of the Puget Sound “Mosquito fleet” of small steamers, the City of Seattle carried President Benjamin Harrison from Tacoma to Seattle. The City of Seattle, with Pres. Harrison aboard, reaches Yesler Wharf (left-of-center) with a flotilla of Puget Sound steamers following and tooting. The steamer was so well-appointed that when the crash of 1893 hit, she was too expensive to run and was laid up until the gold rush of 1897 got the economy under way again. In 1900 the fast and reliable City of Seattle returned from Alaska with real booty -three tons of gold, two tons more than the steamer Portland’s sensational 1897 haul that – at least in mind of a hysterical public – started the gold rush. A first class passenger enjoys the elevated view of Alaska from the top deck. The steamer lost its crown for speed in 1902 when it raced the steamer Dolphin the 800 miles from Vancouver, B.C., to Skagway. The two were often abreast and seldom out of sight of each other. In the end the Dolphin won by a half-mile. The City of Seattle pausing for a stretch at a small Alaskan port in 1919. 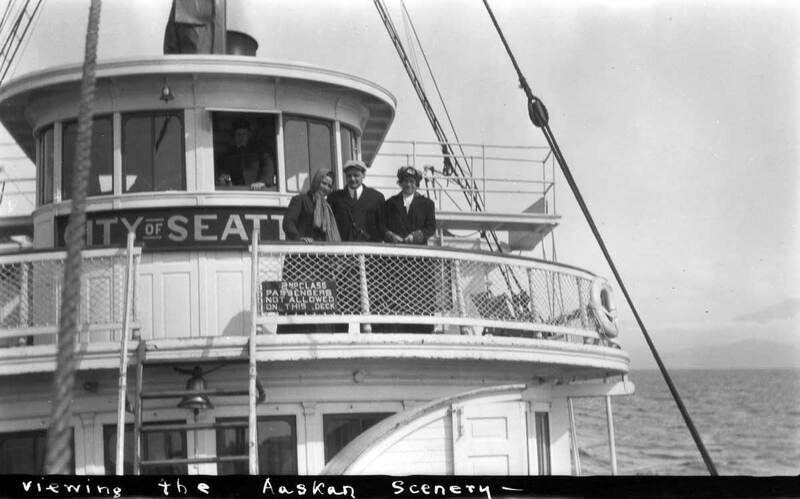 Seattle’s namesake worked Northwestern waters until 1921, when it returned to the East coast, this time through the Panama Canal, for a new career of hauling passengers for the Miami Steamship Co. In 1937, it was sold for scrap. But the steamer is still in fine form in the accompanying photo, which was taken about 1897. The City of Seattle leans slightly to her port side loading or unloading in a slip alongside old Pier near the foot of Washington Street. Happy Passenger types aboard the City of Seattle. Then Caption: The Victoria pulls away from the slip between Pier 2 (51) and Colman Dock sometime in the early teens. 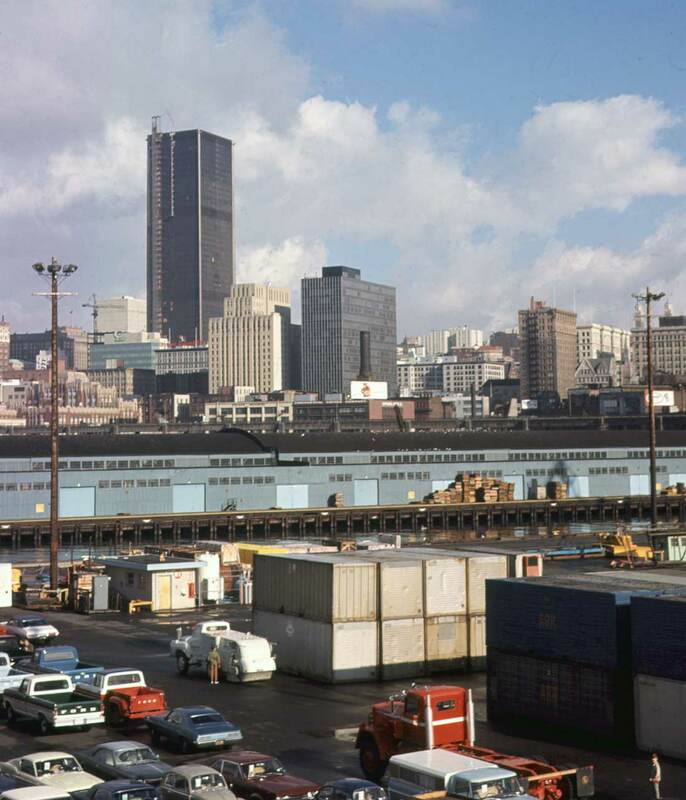 (Courtesy, Lawton Gowey) Now Caption: The modern Colman Dock from the 1960s is without tower – except for the advertising spire near the sidewalk – and the open water slip along its south side has long since been covered for vehicular access to the Washington State Ferries. With “clues” from the tower, upper-right, and a scribbled negative number, lower-left, it is possible to, at least, compose a general description of this crowded scene. The clock turret, here partially shrouded in the exhaust of the disembarking steamer S. S. Victoria, replaced the Colman Dock’s original tower in late 1912. That spring the first tower was knocked into Elliott Bay by the steel-hulled steamship Alameda during a very bad landing. The second clue, the number “30339” penned on the original negative by the Curtis and Miller studio, dates the scene – still roughly – from 1914 or 1915. 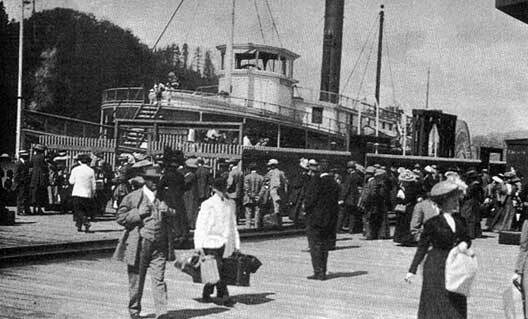 In 1908 the by then already venerable Victoria was put to work on the Alaska Steamship Company’s San Francisco-Seattle-Nome route. 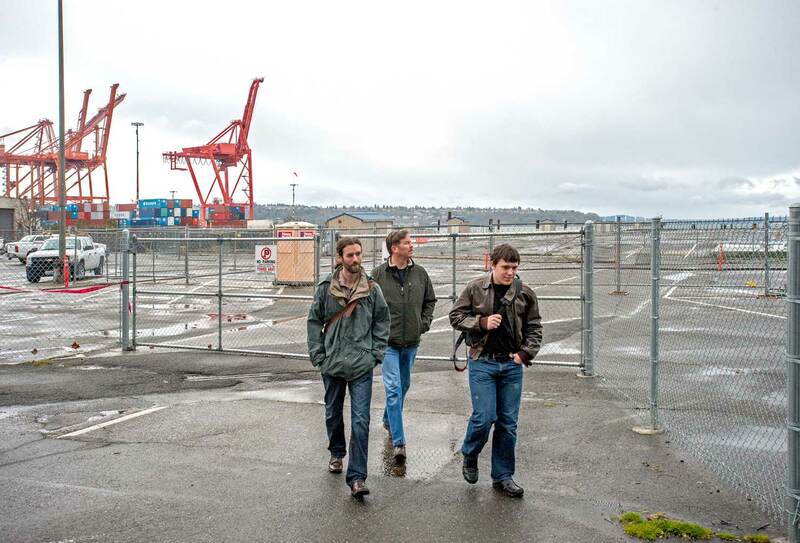 Considering how packed are both the ship and the north apron of the Northern Pacific’s Pier 2 (at the foot of Yesler way) it is more likely that the Victoria is heading out for the golden shores of Nome rather than the Golden Gate. The 360-foot-long Victoria was built in England as the Parthia in 1870 and made her maiden voyage that year to New York as the finest ship of the British Cunnard Line, for many years the dominant North Atlantic shipper. With compound engines she required half the coal of her sister ships, and with the gained room was the first Cunnard ship to have, among other niceties, bathrooms. 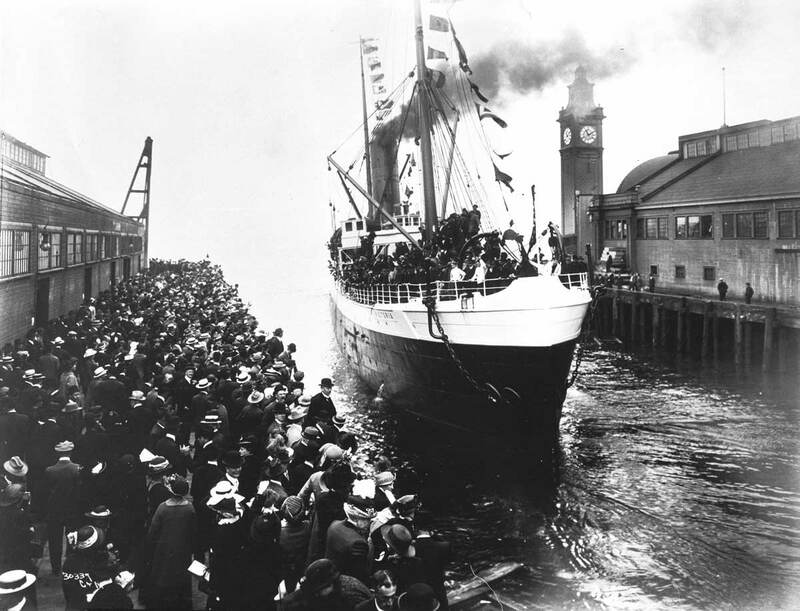 Eighty-six years later the Victoria (She was renamed with a 1892 overhaul, again in England.) was sold to Japanese shipbreakers and in 1956 her still sturdy hand-wrought iron hull was salvaged for scrap in Osaka, Japan. Most likely a few Pacific readers will still remember the Victoria from the depression years of 1936 to 1939 when she was laid up in Lake Union unable to meet the cost of U.S. fire and safety regulations. A least a few eastside readers will recall the steamer from the summer of 1952 and following. On Aug. 23rd of that year the then oldest steamer in the U.S.A. was tied to the old shipyard dock at Houghton (Kirkland) on Lake Washington where she waited first for an ignoble 1955 conversion into a log-carrying barge, and briefly renamed the Straits, before taking the last of her many trans-Pacific trips. That most fateful of journeys was her first trip under tow. Identifying the landmarks – including a few churches – in this 1880 view of Seattle requires a print considerably larger than that provided here. (Originally, that is, in the relatively small Pacific printing from 1992.) So, like the print, we are reduced to making some generalities regarding the scene’s features. First, this record is but one section of a five-part panorama of the city. It was recorded from the railroad coal wharf that, beginning in 1878, extended into the bay from the foot of King Street. The panorama extended north from Beacon Hill along the waterfront to Queen Anne Hill. 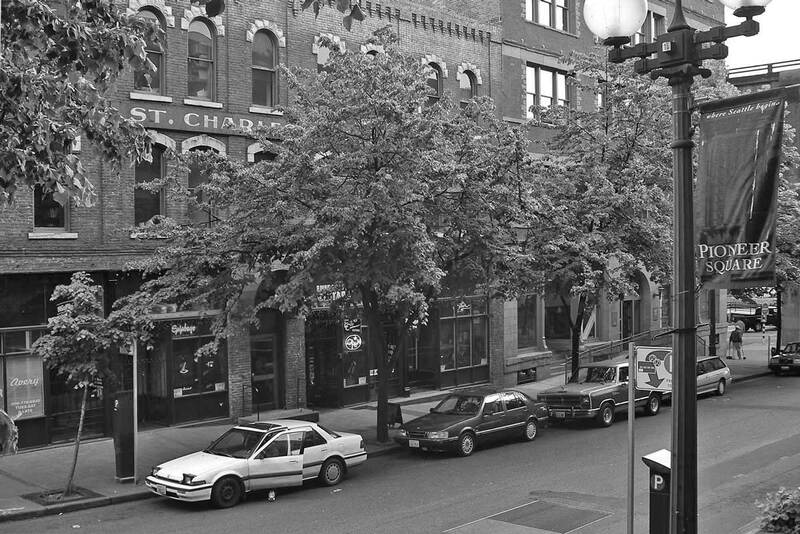 This is the third section of that wide-angle cityscape and extends from Washington Street on the right to Columbia Street on the far left. On the far right, Jefferson Street climbs First Hill. To the left of Jefferson, the fruit trees in Henry and Sarah Yesler’s orchard darken the block between Third and Fourth avenues and Jefferson and James streets, since 1914 the site of the King County courthouse. The Yeslers’ orchard also silhouettes the white facade and tower of Trinity Episcopal Church at Third and Jefferson. Pioneer Square (or Place), in the scene’s center, is as-yet undistinguished by the three-story brick-and-cast-iron landmarks that in 1883 began to surmount this cityscape. Asserting a kind of independence from the scene is the pile of rubble in the foreground. This, I believe, is the beginning of Ballast Island, (or nearly) the mound of imported earth that was dropped here by coal colliers visiting the King Street bunkers for coal in exchange for the ballast rubble contributed here between Washington and Main streets. The ballast was need to steady the otherwise mostly empty ships as they sailed north from San Francisco – mostly – to pick up Seattle’s coal, and/or sometimes lumber too. This “foreign” pile developed into a favorite camping ground for Native Americans – as already noted twice earlier or above.